There are two big international airports in Japan: Tokyo Narita Airport and Osaka Kansai Airport. 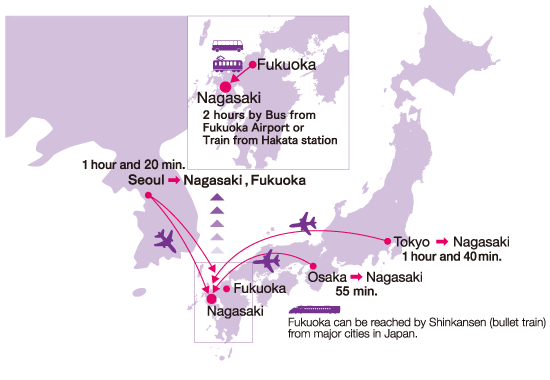 However, catching a flight to Nagasaki from either of these airports involves a commute, which lasts for nearly two hours, to a domestic airport via ground transport. Recently, several flights from London, Paris, Frankfurt and Los Angeles have started to land at the Haneda Airport in Tokyo, which had long been a domestic airport. In addition, there are many direct flights from Haneda Airport to Nagasaki. Thus, to save time, it is recommended to travel to Nagasaki via Haneda Airport. Passengers can discuss this option with their travel agencies. Alternatively, passengers flying to Fukuoka from the Incheon Airport in Korea can take a two-hour limousine bus ride to Nagasaki. From Nagasaki Airport, you can take a limousine bus bound for Nagasaki City. There are two lines of limousine bus services bound for Nagasaki City taking different courses, but both of them can take you to "JR (Japan Railway) Nagasaki Station" at the center of Nagasaki City taking about an hour (fare: oneway-800 Japanese Yen, round trip ticket-1200 Japanese Yen). From there, you can get to most of the main hotels in Nagasaki City within 10 or 15 minutes by taxi. If you are going to the Best Western Premier Hotel, the main hotel of the conference, we recommend you to take the line via "Nagasaki Shinchi / Nagasaki Station", and you may get off at the stop named "Takaramachi" which is the second stop from JR Nagasaki Station. The bus stop is exactly in front of the hotel. If you take another line via "Showamachi/ Urakami", it also stops at Takaramachi, but the bus stop is opposite side of street at the Best Western Premier Hotel. For more information, please refer to the time schedule the following.